After having a home made job I decided to get something a little more universal. I remember seeing someones leak down/vacuum tester that they built for testing chainsaw engines on the arborist site a while ago. 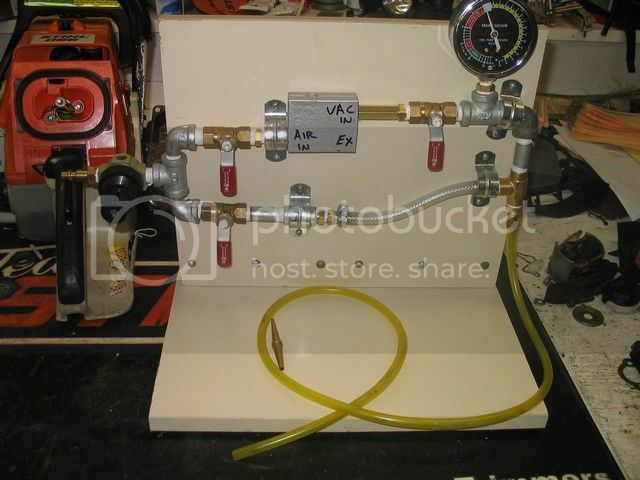 Looks a fair setup, mounted on a board with plumbing fittings all over the place. I'll see if I can find a picture of it as once again its the type of thing I copy to my hard drive. The problem is, we are now testing many other 2T's besides the K5 and we needed more flexibility. Post your pics when you can. Ok well here it is. Not my setul as its from someone who vac and pressure tested chainsaws a lot. Only thing is I forgot to grab a good explanation of it all, from memory the guy used the diaphragm pressure gauge off a gas welding setup to lower the pressure from his garage air to a point where it wouldn't blow crankseals, then shut it off when it was at the right pressure to do the pressure test. Can't for the life of me remember what he used for vacuum. Think he used to take the chainsaws apart leaving the cylinder and head on, pressurised it via the impulse line and put it into a tank to wash it while pressurised. That kept the water out while he pressure washed it at the same time. Then if it held he vacuum tested it as well. If it didn't he had to replace seals anyway.